Students at the School of Engineering and Technology at Hampton University are provided with dedicated Professors and Faculty who are committed to the student experience in and out of the classroom. 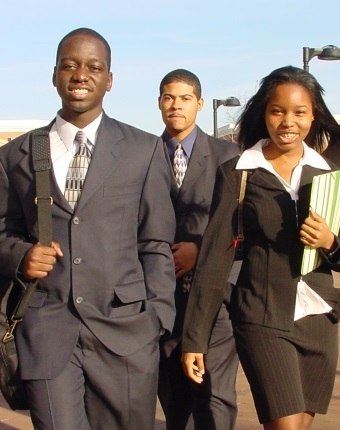 At Hampton University, we work closely with our undergraduate and graduate students to stimulate an environment in which they can grow academically, while building a community of connected, bright, and well-rounded individuals. We hope to nurture lasting friendships of smart, interesting people that enjoy having a great time while developing their careers. School of Engineering and Technology students are involved in a variety clubs, such as athletics, performing arts, Greek-lettered organizations, and professional societies. Students have the opportunity to travel, assist in community service locally and abroad, as well as participate and compete at national conferences. Participating in student activities, clubs and events is a great way to meet new people and overall add to the experience at our Home by the Sea! The internet is home for a great deal of useful information, though sometimes we need to work to find it. The links below are designed to give students in the School of Engineering and Technology a head start. Note that there is no implied endorsement of any of the sites listed below. The sites have not been verified safe for downloads, so the only general advice we can give you is: use the sites for information purposes and only download files or software from sites that you are familiar with, and if you have the proper (meaning up-to-date) virus and spy ware protection on your computer.